If you decide to do only one thing today, do this: visit everynoise, discover new music and have some expansive auditory fun. Every Noise At Once is the brainchild of Glenn McDonald, a self-described data alchemist. 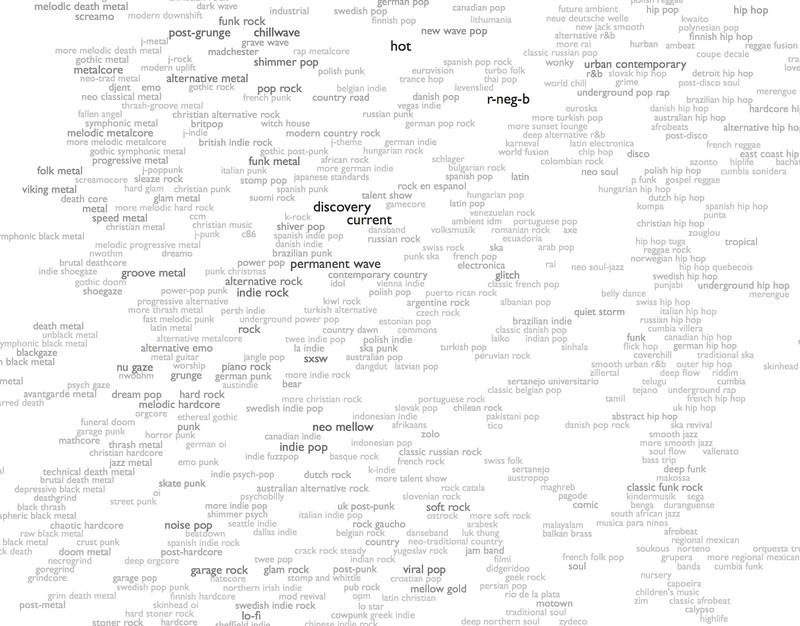 He has sampled and categorized popular music into an astounding 1,264 genres — at current estimates. You’re probably familiar with glam rock, emo punk, motown, ambient, garage, house, dub step, rap, metal and so on. But are you up on: neo-synthpop, fallen angel, deep orgcore, neurostep, death metal, skweee and cow punk? Well, here’s your chance to find out and expand your senses and your mind. Music used to be easy. Some people liked rock. Some people liked pop. Some people liked jazz, blues or classical. And, basically, that was sort of it. However, musicians are a restless bunch and you can only play Smoke on the Water, Always Crashing in the Same Car or Roast Fish and Cornbread so many times before someone is bound to say: “Hang on a minute, what would happen if we played them all at the same time?” And so it is that new genres are born. Now imagine that happening for at least half a century or so – all over the world – and you reach a point at which, according to the engineer and “data alchemist” Glenn McDonald, there are now 1,264 genres of popular music; all you need to do is go directly to his startlingly cleverEveryNoise.com website and look – well, listen – for yourself. Read the entire story and sample some bands here. Image: Every Noise at Once, screenshot. Courtesy of Glenn McDonald, Every Noise at Once.